Russian IT managers claim that Facebook has been poaching staff from Russia, yet some experts remain unconvinced that this is a negative thing for the country’s IT industry. According to Anatoly Karachinsky, president of Russia's biggest IT holding, IBS Group, Facebook has been hiring programmers away from big Russian Internet companies. 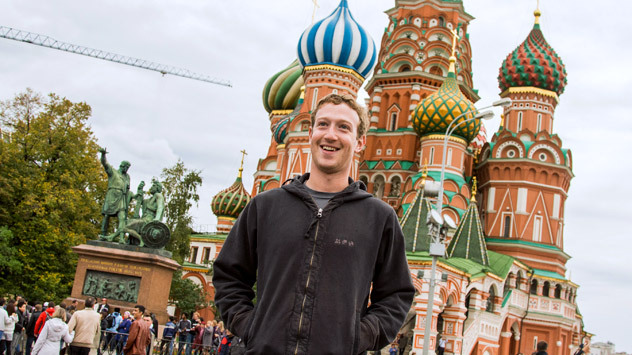 Karachinsky said that Mark Zuckerberg typically conducts personal job interviews with those who have unique and rare competencies. “Those who were interviewed have been telling me they were offered jobs and immediate ‘evacuation’ to the United States,” Karachinsky said, drawing a comparison to Microsoft’s mass campaign to poach Russian programmers during Russia’s 1988 financial crisis. Karachinsky is especially concerned that Zuckerberg does not hide his intention to export Russian talent and that Zuckerberg’s meeting with Medvedev will legitimize this process even more significant and legitimate. A representative for Yandex said that the company has not noticed Facebook tempting away its staff, although Google, Facebook and Microsoft have been on the lookout for Yandex developers. A manager close to the search engine claims that not a single Yandex programmer has left for Facebook in the last 12 months. Recsoft, a customized-software developer, has also not seen any attempts by Facebook to recruit its specialists, according to company spokesperson Svetlana Vronskaya. Facebook did, however, invite Recsoft programmers to compete in the Facebook Hackathon and was ready to accept them without preconditions. Vronskaya believes this is Facebook’s general approach to employees of leading Russian software developers. Facebook, as one of the world’s biggest internet corporations, includes Russian investors and enjoys many users in Russia. Hence, there is plenty of interest in the prime minister’s meeting with Zuckerberg, according to Medvedev’s spokesperson Natalia Timakova. “Medvedev and Zuckerberg have discussed Facebook's possible presence in Russia not only as a social network but also as a company that deals with the most advanced products. They have also discussed Skolkovo as a place where startups could be of mutual interest,” Timakova said about the meeting. It is a good thing when Russian students and specialists are invited to work abroad, said Yury Ammosov, a professor at the Moscow Institute of Physics and Technology (MIPT). “I have several students being trained at Facebook right now,” he said. First, working for companies of a scale like Facebook lends programmers a unique chance for self-realization: they work in a place where technology is born; they are involved in global projects. Second, even if they stay abroad, they do not lose their ties with Russia. For instance, MIPT graduates assist heads of schools at the university to develop academic programs. Ammosov does not think all Russian specialists would even like to move abroad, even though the salary gap between Russia and the United States remains significant: programmers make $30,000-$40,000 a year in Russia and $70,000-$80,000 in the United States. Even so, Mail.ru General Director Dmitry Grishin said that money wasn't the main draw for programmers who leave Russia. “Back in the 1990s, programmers were leaving Russia mostly because of salaries, and because there was nothing to do in Russia. Whereas, now, Moscow programmers make almost the same as those in Canada, and people leave because they believe that working for a Western company is more prestigious,” Grishin said. Western companies have every reason to be interested in Russian programmers: they are technically proficient and eve surpass others when it comes to creativity and the ability to address unconventional tasks, says Russoft Association President Valentin Makarov. He does not think that the recruitment of Russian specialists by foreign firms is a threat to Russia, because there is a balance between those who go and those who return to open their own businesses in the country. According to Medvedev’s spokesperson, the prime minister’s meeting with Zuckerberg covered the social networks' impact in spheres beyond business and IT, including politics. “Dmitry Medvedev joked whether he got it right that Barack Obama will apparently win, since he has far more followers [on Facebook] than Mitt Romney,” Timakova said. Accoring to Timakova, Zuckerberg confessed that, when he and his friends were developing Facebook, they could not have imagined that it would become a factor in world politics.